I’m posting today because I got a question on SingSnap from someone who had read my last post and heard the huge difference between the way the two songs sounded. He wanted to know my secret to singing online! It’s simple, really. You need a good microphone. The first video was done using my computer’s built in microphone. I use an iMac computer which, until a couple of days ago, did not have an external mic. Actually, I was pretty surprised that the first video sounded as good as it did. I didn’t expect good sound quality with the internal mic. Before I got my iMac, I used a PC that had a $10 external microphone. Again, it wasn’t bad, but I sure did miss singing into a “real mic”. The second video was done using a basic, but professional grade, Shure SM58 external microphone. 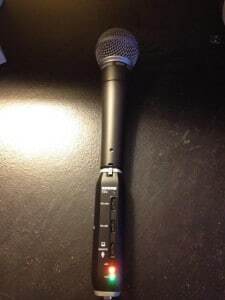 After listening to a couple of my karaoke performances with my computer’s built in mic, I determined that it would be worth it to purchase an adapter that would allow me to plug in the Shure SM58 microphone I use with my karaoke machine at home. My computer requires peripherals that connect with USB cables. The microphones I use offline connect to cords that attach to my karaoke player with regular jacks. Since my computer did not have a place to plug in the regular cords, I needed to invest in a XLR to USB adapter. Off I went to Amazon.com, where I managed to find a Shure XLR-to-USB Signal Adapter. It was selling for $99. I went ahead and bought a desk stand and pop filter as well (thanks, Amazon suggestive selling! ), although I probably don’t need them at this point. The adapter plugs easily into the USB port on the back of my computer and it’s simple to attach the microphone to the business end of the cord. The adapter is also good to have because it has a volume and monitor control, as well as a jack for headphones. The external microphone I’m now using is why my later recordings sound so much cleaner, clearer, and just plain BETTER than the earlier ones do. The model of microphone I use is Shure’s basic model, currently selling for $98. It’s nothing fancy, but it’s well made and solid quality. It’s important to bear in mind that the Shure microphone doesn’t come with a cord. A basic cord that plugs into a karaoke machine costs anywhere from $15-$20, but if you just want to use the mic for online singing, you’re probably best off just getting the adapter, which includes a cord that will connect to your computer. One thing the microphone doesn’t do when it’s hooked up to the computer is amplify. When I use it offline with my karaoke player, my voice is amplified, which I miss with the online karaoke experience. Perhaps my next purchase will be a new set of external speakers! Another odd effect is that for some reason, when I record while using this microphone, the music and my voice can get a bit out of sync. SingSnap.com does have settings that allow users to edit the recording so the syncing can be fixed. The internal mic does not cause the syncing problem, but I think the vastly superior quality of the recordings are well worth dealing with lagging and spending a few minutes editing. You can probably find less expensive mics and adapters online. I prefer Shure products because they are very high quality and hold up to a lot of abuse. I want to thank everyone who listened to the songs I posted last week of my karaoke exploits on SingSnap.com. I’ve gotten some very nice comments that have done a lot to boost my self-esteem. It was a lot of fun writing that article and rediscovering how much I still enjoy karaoke!